The developer switched from applying for permission to develop to demanding permission. Southold Town is no longer the authority. How will the Supreme Court decide? Now more than ever, Group for Cutchogue needs to continue to expose the plans of the developer to sacrifice forever the real heritage of Cutchogue for more and faster profit. 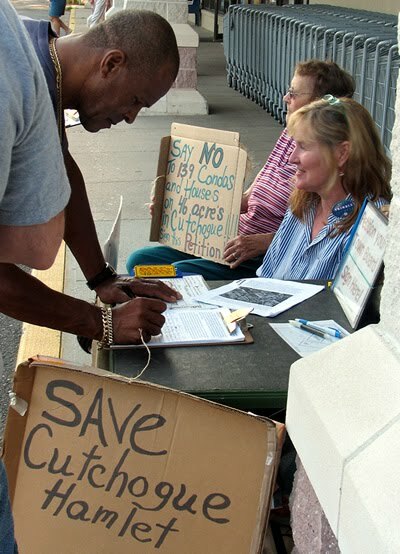 Will You Help Save Cutchogue? Please ask Southold Town Board to stop their doublespeak. If they support comprehensive planning, why aren't they doing it? Their excuses are not just political spin, they are intentional misrepresentation. The Planning Board can not stop over-development, once an approval is granted it will be impossible to stop construction of a new community and destruction of our community. Only the Town Board has the power to legislate. The Town Board should enact a moratorium until relevant laws are enacted such as site plan design standards. If our Town Board continues to wait to see what happens, we know what will happen. One impact the proponents of the Heritage at Cutchogue do not like to discuss is how developers realize extraordinary profit at the cost of the community. The question is why is Southold Town Board allowing it. The impacts of high density development on local tax rates is well established. The tax breaks condominium owners receive are documented here. There is ANOTHER high density residential development application (Click to Preview). NEW - Shop for our community! Learn about the size and impacts of this development – See *. * TWO ROADS; Read *. * Reasons to Rezone and *. * Positive Alternatives and Please visit the new Save Cutchogue Blog savecutchogue.blogspot.com! Farms are being turned into suburbs and cities! *|* please click here! *|* What will the future look like? Southold Town Residents call upon Southold Town government to take prompt and persistent action to halt development of the 139 luxury condominiums proposed as “Heritage at Cutchogue”. The proposal is based on a fraudulent spot zoning in violation of the essential purpose of zoning. Zoning is about compatibility. A zone for high density luxury residential right next to an agricultural zone is wrong. The resulting proposal is out of synch and out of scale with Cutchogue Hamlet and Southold Town. 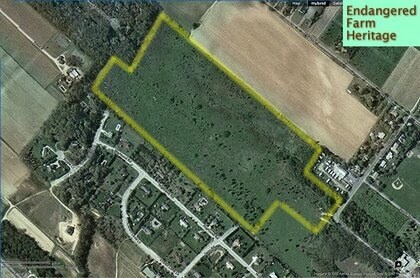 We ask the Town Board to immediately enact a moratorium to prevent construction beginning before the zoning of this property, and of other similarly zoned properties in Southold which are also facing imminent development, can be reconsidered and a rezoning can be enacted by the Town Board before it is to late. Southold Town was considering revising land use regulations! According to a memorandum dated November 18, 2007 by Heather Lanza, Town Planning Director to Scott Russell, Supervisor and the Members of the Town Board, Southold Town Code lacks residential site design standards and Southold Town lacks an updated and effective comprehensive plan. Suffolk County Water Authority has been expanding rapidly on the North Fork peninsula. Initial agreements to limit availablity of public water to existing development with water quality problems have been surreptitiously replaced by acceptance of using public water imported from Riverhead to supply new developments. *|* Saint Patrick's Day parade in Cutchogue was alot of fun! Save Cutchogue was there.